Surgical procedure, also commonly called as operation or surgery, can be defined as a medical procedure involving an incision with instruments; performed to repair damage or arrest disease in a living body. U.S. healthcare industry is the largest healthcare industry in the world and annually thousands of surgical procedures are carried out by specialists across the nation. Increasing aging population, rising cases of life style related health problems and favourable government policies are some of the key growth drivers for the growing surgical procedure market in the Unites States during the period of study. The United States is one of the largest markets for surgical procedure in the world. U.S. surgical procedure market is driven by best in class health care infrastructure equipped with advanced and state of the art equipments and technologies coupled with higher spending on healthcare by its residents and better reimbursement policies by the U.S government for healthcare services. The U.S. surgical procedure market is expected to grow in the near future primarily driven by increasing geriatric population in the nation, growing cases of life style related health problems amongst its citizens and continued favourable government policies for healthcare expenditure. This report identifies the global U.S. surgical procedure market size for the year 2014-2016, and forecast of the same for year 2022. 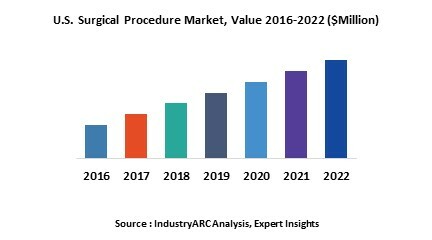 It also highlights the market drivers, restraints, growth indicators, challenges, and other key aspects with respect to global U.S. surgical procedure market. U.S. surgical procedure market research report is classified on the basis of surgical procedures carried out. Some of the major surgical procedures covered in this report are as follows: Cardiovascular(Cardiac Rhythm Management Device Implantations (Cardiac Pacemaker Procedures, Implantable Cardioverter Defibrillators)Interventional Cardiology Procedures (Cardiac Catheterization, Coronary Revascularization, Coronary Angiography),Heart Transplantations), Neurosurgery (Craniotomy, Aneurysm Coil Embolization, CSF Drainage, CSF Shunt) Orthopaedic(Joint Replacement Surgery (Knee Replacement, Hip Replacement, Shoulder Replacement), Ligament/Tendon Repair, Spine Surgery Market(Spinal Fusion, Others),Ophthalmic (Cataract Surgery, Glaucoma Surgery, Refractive Surgery), Gynaecology (Hysterectomy ( Laparoscopic Hysterectomy), Uterine Artery Embolization, Cesarean Section), Others (Urology Procedure, Dental Procedure).